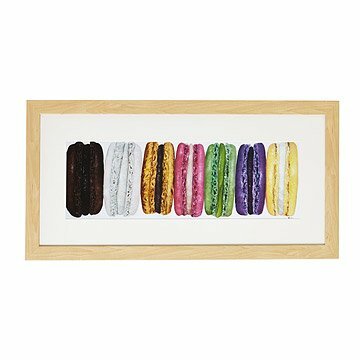 Treat your decor to this photorealistic print of mouth-watering macarons. If you are familiar with the sophisticated pleasures of the classic, French macaron, then you may need to keep yourself from drooling over this print from Brooklyn, New York, artist Ashley Alioto. She has prepared a batch of the rainbow-colored confections, but her secret ingredient is acrylic on canvas. These prints on archival paper capture the image of her original artwork with such high definition that, when viewed up close, you can see the paint textures and brushstrokes. When viewed on your wall from across the room, however, the painting looks photorealistic, and you might just need to keep yourself from drooling. Can be displayed horizontally or vertically. Printed in Oregon. Ashley Alioto is a Brooklyn based visual artist. Born and raised in downtown Brooklyn, Ashley has always had a passion for culinary arts. She began her career working in pastry kitchens of fine dining restaurants throughout New York City. Interested in further developing her artistic skills, Ashley began creating sugar and chocolate sculptures. After joining a pottery and oil painting studio, Ashley was influenced by artist and studio director Joel Loeper to begin oil painting. Currently, Ashley is a member of Brooklyn Art Space in Gowanus, Brooklyn. Her artwork can be seen in various restaurants and cafe's in NYC. Ashley’s fascination with highlighting various textures and colors of foods translates into every brushstroke. Her realistic oil paintings attempt to capture that moment when a person becomes fixated on a food and cannot help but "lick their lips" and succumb to its allure. Arrives framed and ready to hang in a walnut durian wood frame or unframed and mounted to acid free mountboard. This is a really attractive print and it is as described. Unfortunately the mat is covering a noticeable portion of the print and I will have to pay to have it fixed by a professional. I am unhappy with the fact that whoever put this together did not take the time to do it properly and professionally. Only order this if you are willing to take the time and spend the money to have it properly matted and framed. The matt was cut too close to the picture so that the cookies are slightly cut off. We are keeping it - may have a new matt cut for it.